After nearly sixty years of trying to understand human beings, I have set upon a simple theory. The customary diagnostic manual, arcane and Byzantine as it is, is less than useful, especially if one holds to Occam's Razor that the simplest explanation is the best, as in not multiplying entities "beyond necessity." Most of us are caught between two polar opposites: security and freedom. If we're secure, such as civil servants, we pay for it with subordination, humiliation, and constraint. If we're free, such as entrepreneurs, solo professionals, craftsmen, and artists, we're insecure. The price of security is depression, and the price of independence is anxiety. Varying intensities of these two states of being describe most of us. They're not emotions, such as lust and greed, which energize us, but states of being, the way we function. In one way or another, most of us move back and forth between depression and anxiety. I know I have. The intellectual nabobs call it the existential situation, the way it is. So there we are, and what to do about it? Well, we can think about what's good for us. First, it's important to connect with the something elemental, like dirt or water, because they're our origins. At the beach at sunset, often as not, solitary individuals or couples, stand at the shoreline, staring out toward the horizon, connecting with themselves in an fleeting moment of infinitude, finding within themselves the soul they'd forgotten. Dirt will do it, too, as in digging into it and letting it flow through our fingers, and more than that, smelling it, especially after a rain in that treasured fusion of dirt and water. The nice thing about doing it in the dirt is that we can grow things in that fusion, especially beets (Beta vulgaris). Meine Überfrau often falls into a rhapsody over drifts of daffodils in the spring, recalling Wordsworth's daffodils "fluttering and dancing in the breeze," as her heart "dances with the daffodils." Coming along later in the spring, during the summer, and into early fall are drifts of variously hued leaves of beets, nearly as charismatic, strewn across a garden's bed. The variety of beets is astounding. Three beguiling ones are readily available in seed packets at commercial nurseries: Bull's Blood, di Chioggia, and Burpee's Golden. Bull's Blood, an heirloom, is a deep Burgundy, sometimes with candy stripes, maturing in 45 days. Di Chioggia is a mild Italian heirloom, pink with bands of white, maturing in 60 days. Burpee's Golden is yellowish and orange and mild, maturing in 55 days. Root as well as cool weather vegetables, they're suited for Flagstaff's climate. They have a variety of uses. First of all, their foliage is beautiful enough to dress up any garden. 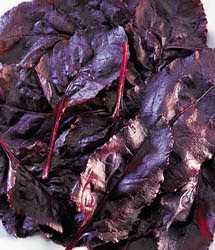 Originally, eaten for its leaves, the leaves are favored for salads and boiled as is Swiss chard, their horticultural kinsmen. Finally, their roots, those delicious orbs, are a delight at any table, boiled, roasted, or raw in salads, especially the di Chioggia with its bands of pink and white. Nutritionally they are whiz bangs, full of folates, manganese, potassium, fiber, vitamin C, magnesium, tryptophan, iron, copper, and phosphorus. High in sugar, they are low in calories. Excellent at inhibiting cancer, especially colon cancer, and heart attacks, they are anti-inflammatory. With seeds resembling Grape-Nuts, they're easy to sow at half an inch depth with five inch spacing, they do well with a balanced fertilizer and germinate in 14-21 days. They relish, as do all root vegetables, a friable soil with plenty of organic matter. Aside from their beauty, taste, nutrients, and tonic qualities, beets are satisfying. Processed food is not, leaving the eater craving more of the same. One bite begets the next, but beets have a high satisfaction quotient. 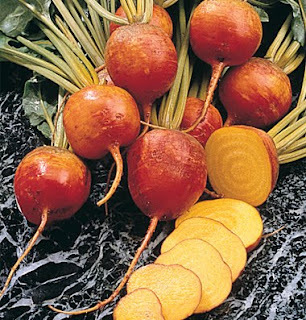 While not exactly a frisson, beets satisfy, a salubrious quality when a person is on a sliding scale someplace between the frets and the blues. Eat beets and stay healthy of mind as well as body after digging in the dirt. By the way, Olga Johnson, a native of Saratov in southern Russia, has an excellent recipe for borsch soup at http://oldfartskitchen.blogspot.com.